HOUSTON — A takeout box of chicken wings sat on Russell Westbrook’s lap for a few minutes late Tuesday night, until Steven Adams finally asked where his teammate had procured the tasty morsels. “You want some?” Westbrook asked, passing the box two cubicles away. “Careful, they’re spicy.” The 7-foot, 260-pound New Zealander devoured two in less than 24 seconds. Unofficially, it was Westbrook’s 10th assist of the night and his final triple-double (to go with the 47 points, 11 rebounds and 9 assists on the floor) of the most scintillating NBA season anyone could remember — a season suddenly and sadly devoid of Russell Drama. Somewhere outside the Toyota Center’s visiting locker room, “Celebration” pumped loudly through the arena speakers. Kool & the Gang and the Houston Rockets had advanced to the second round of the Western Conference playoffs, dispensing Westbrook and the Oklahoma City Extras in five frenetic games. Down the hall, James Harden and crew were smiling big, looking more ready to trade bombs for seven rounds with the Golden State Warriors than anybody else in South Texas right now. And yet, away from the howls on Polk and LaBranch streets outside, it almost felt hollow. The most thrilling character of the past eight months is done after 82 regular-season passion plays and just five measly playoff contests. It feels like Jon Snow took medieval steel through his chest plate in Game of Thrones Season I. It’s as if Cookie Lyon caught a stray bullet in the club five episodes into Empire and never batted her baby browns at Lucious again. What studio head kills off Westbrook five games into the NBA postseason? What kind of scriptwriter is that cold? Look, between Kevin Durant’s health and the Rockets’ fuel-injected game, the Warriors’ road to their third straight NBA Finals has enough obstacles to carry the league’s broadcast partners into June. But let’s not pretend the small-market sound barrier that Westbrook broke in Oklahoma City this season will not be missed. He is the most compelling, confounding, cocksure, can’t-take-your-eyes-off player since Allen Iverson. And, like A.I., he now suffers from the Curse of Being The Man … Who Needs Another Man. There is justified criticism this morning that a guy who makes just 14 shots and misses 35 in the fourth quarters of a five-game series should think about deferring more. And there will be some knee-jerk takes that this is what any player who believes he can single-handedly carry an organization deserves: a first-round exit amid a hailstorm of shots careening off the rim. It was painful, for example, to watch Victor Oladipo with about four minutes left Tuesday night. He had a good look from the top of the key, behind the 3-point line. But he had just missed from the right elbow and tried to find Westbrook. The Thunder were down seven, and this was an important possession. Rather than shoot, Oladipo rifled a too-high, too-hard bullet out of Westbrook’s reach for a turnover. When your teammates pass up good, open looks so you can take a worse shot, that’s not winning basketball. And yet, this is the world K.D. left behind when he bolted for the Warriors as a free agent last summer: Russ and a reclamation project. Hoisting a franchise on your shoulders doesn’t feel like a burden at first — until you realize your only shot at getting back to the Finals in a place like Oklahoma City is getting another future Hall of Fame teammate. There had to be at least one moment the past two weeks when either Westbrook or Harden wondered why they and Durant were all on different teams now, and what it would have been like if the Thunder team that went to the NBA Finals in 2012 were now the league’s premier Big Three, a Big Three that Harden said at the All-Star Game that he believed could be the NBA’s greatest Big Three ever. Like Westbrook’s historic season, it’s all in the mirror now. He’s quirky, a major enigma, more unpredictable than the weather or a certain leader of the free world. But he was must-see, wasn’t he? Westbrook will win the MVP this season not because he is the first player to average double figures in points, rebounds and assists for an entire season since Oscar Robertson. He wins because he forced you to feel more. Awed. Inspired. Infuriated. Sometimes, he just made you keel over from laughter. Like Tuesday night, when he explained why he and gum-flapping, mean-mugging Patrick Beverley of the Rockets got double technicals for jawing face to face. Russell Westbrook (No. 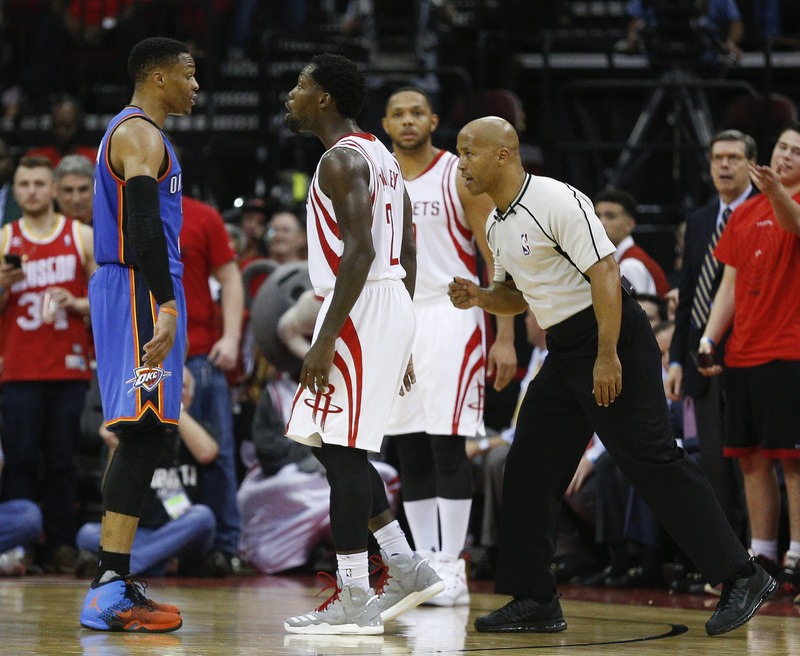 0) of the Oklahoma City Thunder and Patrick Beverley (No. 2) of the Houston Rockets confront each other in the fourth quarter during Game 5 of the Western Conference quarterfinals game of the 2017 NBA Playoffs at Toyota Center on April 25 in Houston. In a season of indelible moments, I go back to mid-January at Golden State. It wasn’t a left-handed, throwdown dunk in traffic or an impossible jackknife-and-the-foul bucket that got me. Insanely, apparently unconsciously, Westbrook walked seven — seven — steps without dribbling the basketball before he heard a whistle. The man took just five fewer steps than a recovery group! He then had the temerity to inquire about the violation. This might be the single most audacious turnover in league history. Even when he messed up, you rubbernecked. Every good NBA analyst or credible numbers guy can calculate his value down to the shot. But when it comes to Westbrook, there is only one statistic that matters in my mind: How did your team fare the season after your other superstar left? See, people forget what Oklahoma City was like last summer after Durant’s open letter in the Players Tribune. It was Cleveland after LeBron James left the Cavaliers in 2010, a scorned town that couldn’t believe it had been left at the altar after such a long courtship. It was L.A. in the summer the Lakers decided to separate Kobe Bryant from Shaquille O’Neal, trading O’Neal to the Heat and leaving the City of Angels split over which one was the devil who killed their budding dynasty. Out of that hole crawled a hurt and humbled Westbrook, who really didn’t want Durant to leave despite all the moments he loved stealing the spotlight. He did nothing but put an entire city on his back and start to climb. The year after James left for Miami, the Cavaliers went 19-63, which was understandable because they didn’t have another star. But this is more telling: The year after O’Neal was traded to Miami, the Lakers with Kobe went 34-48 with no postseason appearance. Same goes for the Milwaukee Bucks after Robertson retired. Kareem Abdul-Jabbar, the most dominant force in the game, could only take the Bucks to 34 wins without the Big O. Both the Lakers of 2004 and the Bucks of 1974 had gone to the NBA Finals the season before. Westbrook, with a thin supporting cast, led the Thunder to 47 wins and the playoffs in the most dominant season by a point guard since Iverson backpacked Philly and a roster of Aaron McKies and Eric Snows to the Finals in 2001. There is an irony, of course, in needing so much selfishness in your game, a character trait that isn’t supposed to be a real asset for a point guard, to make your team successful. But even if his right arm were about to fall off from taking all those shots, every moment on and off the floor was captivating and colorful. And that’s not even counting the fashionista side. At one point Tuesday night, he had missed 12 of 15 3-pointers, some of them way off the mark as his legs tired. For one of the few times this season, the indefatigable man looked flat-out gassed. It made you wince — until the moment where he missed two free throws, somehow got the rebound, raced out to the 3-point line as if he had a spoiler attached to the back of his jersey, took an ill-advised, crazy 3-pointer with hands in his face … and drilled it. You know the best thing about this riveting, pulse-checking NBA season? Russell Westbrook. The most compelling basketball player of the year was reduced to the bottle trick and a sugar high in a season in which his character was killed off way too soon.